Another year, more time to hone our practice as facilitators. As I’m sure has been previously mentioned in the pages of this blog, the meaning of the term “facilitation” derives from its root “facile,” or easy, so facilitation is intended to make something easy or easier. Now this is not to say that the practice of facilitation is or ever should be easy. And it is not about doing work for others (“Thank goodness you get to be the one trying to guide this group!”) so that they in some sense get off the hook. 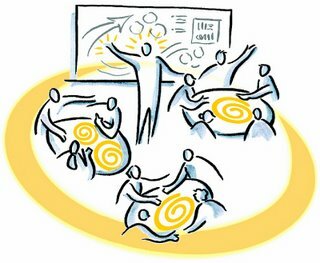 Facilitation is a lot of work, and much of it happens before one sets foot in the room and when it may appear that the facilitator is doing little or nothing (holding back; creating “void;” letting the group step up; asking a concise, well-timed, and developmentally-oriented question). I would say that at its best facilitation makes it easier for others to identify and focus on the work that must be done to significantly move things/themselves forward, which is often the hardest work – identifying core values to guide efforts, having honest conversations, thinking outside of the box (or in some cases, making sure that you are thinking while INSIDE of it). I like to link the practice of facilitation back to our definition of Facilitative Leadership, IISC’s core approach to leadership for social change. We define this approach as being about “creating and inspiring the conditions for self-empowerment so that people can work together on a shared goal.” Facilitation is a practice for creating these conditions for self-organization and emergence. Implicit to its exercise is building capacity in a group to identify processes that serve it best in its own mission-centric and purposeful pursuits. At the end of the day, facilitation, like leadership, is a team sport. It requires the efforts of everyone to see what serves best in guiding collective development, and at times it may require some more heavy lifting on the part of one or more readily identified and named facilitator/s. But it should not get stuck there. How about you, what commitments might you make in this new year to bring facilitation to another level of maximizing human potential? Regarding liberating structures, you may enjoy the new site, http://www.liberatingstructures.com/ which is an amazing resource from Keith and Henri! Thanks, Nancy. We do know that site and I actually tweeted their library of LS techniques the other day. Finding deep resonance Curtis, I have been immersed in some intensive facilitation this week and truly experiencing how blessed we are to get to do this work. I will stand with you on these commitments. I am also interested in working with “heat,” even intentionally turning it up, as I am more and more convinced that the hot zones are the spaces that yield adaptive change. I am committed to seeking feedback, and I’m ready to understand that when you work with heat, at least some of the feedback has to be negative – I don’t want to be intimidated by that when working with adaptive change. Completely feeling you on the heat front, Gibran! I have the words of Carol Sanford running through my head – “Development happens through destabilization.” Part of being destabilized or disrupted is the heat. And I agree that some of that can come back on us. And it’s really not about being liked, but being effective. Sometimes those don’t go together. it is really useful to share and serves to me communicating tool to target groups. please keep on sharing!